Malcolm Fraser lived and worked his work, then he died. His political career and mine started around the same time: he became leader of his party and I became a voter. I enjoyed voting against Fraser and I enjoyed disliking him. At the time I barracked hard for the brilliant Whitlam. By contrast I found Fraser dour, unimaginative and colourless. But from the first moments following the Dismissal I liked Gough less; the oratory which had always sparkled now became tarnished with absurd hyperbole: expressions such as “Maintain the rage”; “Kerr’s Cur” and so on. In time I discovered no-one could adore Gough as much as he loved himself, while Malcolm seemed to grant himself no more regard than we did in the electorate. “I was born in the Democratic Republic of Congo but when I was about 1 years old the First Congo War broke out and we fled and we went to our first refugee camp in Nakabande and then from that camp we returned back home again to Congo. The Second Congo War broke out and I was almost 2 years old. My family fled again and when we fled this time we knew it was something that was going to be permanent – we wouldn’t be returning back – and it’s a very long journey from Congo to wherever we are going because we didn’t know where we are going. We found ourselves on the border of Congo and Uganda but we didn’t know who was going to be waiting – it could be the rebels to kill us or it could be someone to help us. Luckily the UNHCR were there and we were rescued by them and they took us into another refugee camp in Uganda…from there it got too crowded – too many people coming in – and so they had to move us to another camp. We were given cooking oil, beans, flour and we settled there. The UNHCR gave us tents and eventually land to start our new life there and we were able to build our own houses. In 2002 we were attacked by rebels in that camp. We did have protection but…it was quite a walk from where we were to them. It was a military base where they had soldiers and they were supposed to protect us but because they were so far away from us the rebels came from the other side, not the side that they were on, so they were not aware of us being attacked until some of the men …went to tell them that we had been attacked. They had taken my Dad. Because our house was the first on our Block (like a suburb) and the place around us hadn’t been cleared of heavily grown bushes we didn’t hear anything. About four heavily armed men kicked down our door (this was about 11-11.30pm) and wanted my eldest sister but Dad said no and so they took him. I remember that very vividly. They killed a woman that had a baby on her back but her child survived. My mum took us and fled with the other women and we went into a part that was well hidden by overgrown grass and trees. We were stuck not knowing whether Dad was coming back in the morning or not. A lady young enough to jump rope inscribed her book of poems and sent it to me through my sister in New York City. The sister claims the poet as a friend. That is no small boast, for the poet in question is a celebrated thinker, a public intellectual who has advanced the thought of a generation. First impressions: the book is slim, at my age a mercy. A quick glance at the cover – pleasing design, the lacing of leaves, a hint to the content, which is to do with the lacing of the generations. A sinking feeling, a bracing for the assault which must follow. A needful assault, I must declare. The world has forgotten; Europe has forgotten; the young at their universities agitate as if they never knew you needed to know. But still, holocaust poems! Did not Paul Celan write, ‘after the holocaust there is no poetry’? Inevitably there is poetry, inevitably man must sing. After Celan, as after Cain, we can sing no more of man in primal innocence. We sing on, however, because we remember, we sing because we lament, we sing because we breathe. This book of singing is singular because the commemorator was not there, not in the Shoah. But she was there – insomuch as I (with my family intact and untouched in Australia) – was also morally there, also implicated, wounded, alongside all my people, alongside all people of all peoples. Open the book, read. You hear a voice that doesn’t hector or scream or even moan, a voice delicate, tactful; and lively with empathy. The poet, Blu Greenberg, born and raised in the USA, was not directly affected, but – as we have learned from the developing study of epigenetics – the trauma of a previous generation can, in a real and concrete sense, be heritable. Stress hormones are measurably increased in later generations of survivors. In this way the pain of one can spread, from the victim to her relative; from that relative – through her verse – to us all, an emanation for our sorrow and our enlightenment. Greenberg knows what she knows and by subtle indirection, she shares her knowing with us. And like Coleridge’s Mariner, we rise on the morrow morn, sadder and wiser. What’s poetic about that – a list? “Trigger Words” is not a poem you’d recite for the beauty of its words. But it all works as poetry by its density of meaning. Twenty-four words carry a universe of meaning, a world of pain. Without recourse to emphasis Greenberg manages to convey all. Working simply through the alphabet of human experience she stirs the shared memory of humans. We read, we feel the uncommon jolt of twenty–four common words and we know what humans have known since Cain. And we remember. Come here and touch me. What that closing line works within me is alchemy. I remember a pain that was never mine but which is the inheritance of all, remembered through the electricity, the innocence of childhood, that universal time we all had and we all lose. Running along the road in the early mornings through the sleeping town and out through the canefields I ruminate on Gawande’s important recent work, ‘Being Mortal’. I think of the quick and the dead and I think of the slowing that comes to the quick before they join the dead. Before me, beside me, ahead and behind lie cane toads, flattened by motor cars. Quick as they were but yesterday, they were not quick enough. Now they lie about me, very dead. How, I wonder, does the cane toad die? I mean in nature, without cars, wheels and tarmacadam? Does Old Toad embrace his kin, exchange farewells, lie down and, like the stoic Inuit, wait? Does he – or do his relatives – euthanase him with their poison? It is to the merit of Dr Gawande that my thoughts soar to such heights in the mellow time before sunrise. Dr Danny is a Queenslander. He knows. Over ten minutes he enlightens me: ‘Scientists introduced cane toads to Queensland to defeat the cane beetle that was eating the crop. The idea failed – wrong toad, wrong beetles. Both thrived. The toad multiplied, spread throughout the waterways and headed west to despoil Arnhem Land and the Top End. ‘Cane toads became so numerous they even outnumbered the next most prevalent pest, the Grey Nomad. Growing up in Bundaberg I never saw a road free of toads. There’d be thirty between our front door and the gate. They love Queensland. They feed on our lizards, our insects and our own frogs. Our frogs are cute. The toads are not. Is it the motor car, I wonder? ‘No, not the car. No human agency can take the credit. That’s not for lack of trying. People carry golf clubs and practise their driving on the toads. They freeze them, which is said to be merciful. From time to time the ‘papers offer a prize for the greatest number of frozen toads. The Innisfail Advocate presents the winner with a voucher for a banquet of frogs’ legs at the local French restaurant. ‘All of this turns out to be a token gesture. None of it slowed the marchof the toad north and west. And the toad had no natural enemies. Birds would swoop, peck and die. The dorsal poison glands killed them. Man’s best friends died like flies: I mean small dogs; they’d bite and froth at the mouth. I had to wash out the mouth of my Grannie’s King Charles Cavalier whenever I went to stay with her. The dog never learned. Bloody still in tooth and claw, Nature operates with impartial grimness. But my question remains unanswered: what End of Life Directive does Old Toad give his offspring? How does the toad die? What lessons can we learn from this supremely ugly, universally loathed creature? Barring sudden death at the hand of man or God, I shall see the day when I will resemble the cane toad, unattractive and an ecological burden. This is the lot of humankind: just as we are born helpless, we return in old age to a state of helplessness some time before the end. We will lie and we will wait. Meanwhile, whether by command or uncommanded, the same body fluids will flow, the same needs persist – for company, for care, for loving touch, for music, for flowers, for light and mirth, for the sight of children at play. Some good soul or some sour misanthrope or some hired wheeler might wheel us outside into the garden where perchance we’ll sight the cane toad uglifying the scene in all his coarse vitality. And we will envy him. I have taken this story verbatim from the free brochure produced by Babinda Information Centre Volunteers and funded by the Cairns Regional Council. The volunteer who gave me my copy, a gracious and helpful lady a good deal older than I, told me: “The authors wrote this a very long time ago. They were a man and a woman who became knowledgeable about the local tribes. They both passed away many years ago.” I acknowledge my debt to those writers. I trust I have violated no-one’s copyright. I will be pleased to receive any information that will put me in contact with the heirs of the authors. More fundamentally, I acknowledge the traditional owners of these lands and thank them for welcoming me here. I swam in these beautiful waters, enjoying them among the descendants of the original inhabitants. Mothers and fathers of brown kids and pink kids joined tourists, backpackers, Asian tour groups and an old white doctor, cooling upstream of all and danger and loss. “A long time ago, when the Yidinji tribe lived in the Babinda Valley, there was a tremendous upheaval that created these unusual shaped “Boulders” with their foaming, rushing waters. In the tribe was Oolana, a very beautiful young woman. 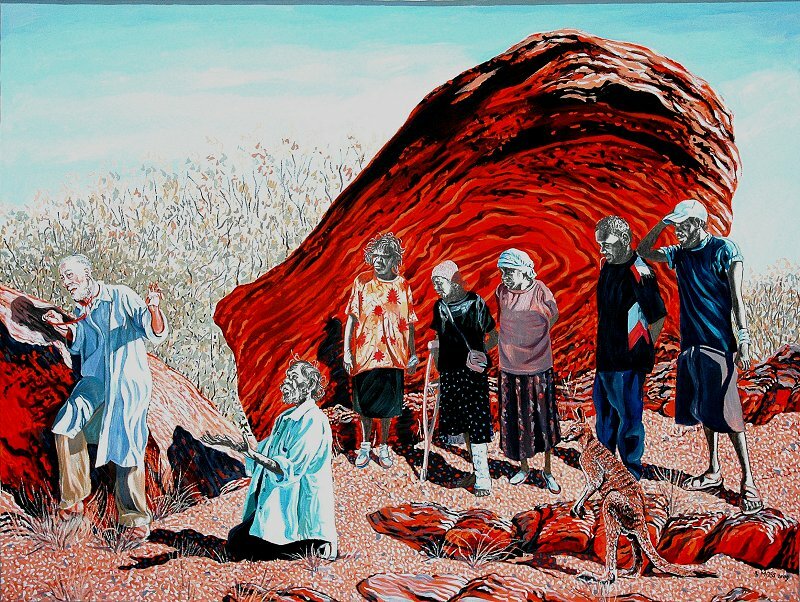 Also in the tribe was Waroonoo, a very old, wise and respected elder. It was decided these two should be given in marriage to each other and so it was done. Some time later a visiting tribe can wandering through the valley and as was the custom of the friendly Yidinji, they made the strangers welcome, inviting them to stay. In the tribe was Dyga, a very handsome young man. All eyes were upon him for his grace and beauty. At first sight Dyga and Oolana fell in love. “So great was their strong attraction for each other they arranged to meet secretly. Knowing full well their desire for one another would never be permitted they ran away. Oolana knew she could now never return as she was rightfully married to Waroonoo. They journeyed well up into the valley, spending wonderfully happy days together as they camped under Chooreechillum*, near the water’s edge. were dragging her back, forcing her to return with them to the rest of the tribe. Suddenly she broke away and violently flung herself into the gentle waters of the creek, as she called and cried for Dyga to return to her here, but the wandering tribe had gone and with them her handsome lover. Would he ever return? Just at the very instant Oolana struck the water, a tremendous upheaval occurred. The land shook with terror and sorrow as Oolana cried for her lost lover to come to her. Her anguished cries spilled out as rushing water came cascading over the whole area. Huge boulders were thrown up and she disappeared into them. Oolana seemed to become part of the stones as if to guard the very spot where it all happened. * Choorechillum, Queensland’s highest peak. Its whitefella name is Mt Bartle Frere.